Not required for Europe. But maybe new rules for next year like wash Bono's yacht or maybe clean the windows of one of his three mansions! And of course pay another 40 quid for a subscription. So basically, if I do not want to use my code for the US leg and am waiting on European dates, I do not have to do anything before Sunday? It would be nice to have some definitive statement on the website or even a note in the numerous emails I am receiving telling me that I must take action by Sunday in order to access to presales. All it would take is to add "US" before presales! I'm the same. I'm in the UK and only want to go to a European show. Why is it not made clear anywhere whether us European's have to go through this verified fan thing or not???? Surely it can't be that hard to get a yes or no answer?? I know...how hard can it be to put a header on the set up part of the account info which says...’this process is for those wishing to participate in North America shows only’, for rest of world dates, please await further instruction’....or something like that. Really..HOW HARD CAN IT BE to give everyone else in the world who is not wanting to go to a US show, some clarity? It’s really frustrating and getting emails telling you you are not yet verified is very unsettling. I don’t want to link my ticketmaster account to a US account, receive text codes and then find out I’ve missed out on Europe. I know this has been debated in the ‘unclear situation for Europe’ thread, and the consensus was don’t do anything and wait for more Info in BUT PLEASE can this just be made officially clear on our account page!? I’m fretting already. I’m subscribed so that’s ok. But I am stressed out already and it’s not even 2018 yet LOL. Thank you for your email. I'll be glad to assist you. This Presale and verification process is for U2 shows in U.S. + Canada only. You only need to complete the registration if you wish to attend a show in the U.S or Canada." 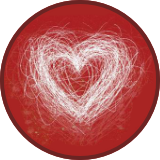 "I am in the UK and want to participate in the European subscriber presales early next year. 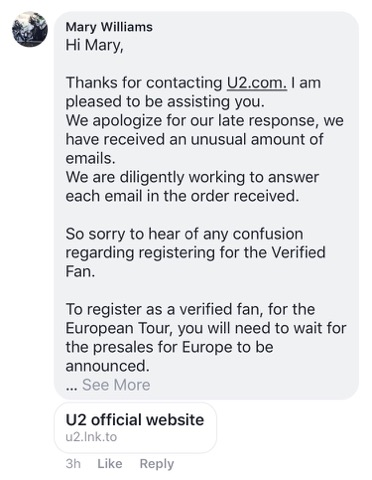 Do I need to renew my U2.com subscription before the 12th November deadline, or is that only for people who want to participate in the North American presales? Also, is there any need to create and connect a US Ticketmaster account if I don't intend to buy tickets for the North American shows?" "Sorry for the confusion with the set up. No need to complete the setup if you are not interested in purchasing US/Canada tickets. Simply wait for the European leg of the tour to be announced." So I guess I won't bother renewing my subscription until nearer the time.